I'm so grateful for the little gifts that spring into our lives through no effort of our own. Here is a baby hummingbird nest that rests in a tree above a 1oo year old snapping turtle at the home of my best friends - Max and Vicki. What beauty! I'm grateful for such moments. Through my Feldenkrais body movement classes, I've been thinking a good deal about the role gravity plays on our bodies. Our bodies need to learn to make use of gravity to act efficiently. One only need recall the painful sight of heads cranked far forward in some of the elderly to see gravity's effect over time on someone with poor posture. Childbirth should also make use of gravity, and that implies a delivery made by a mother who is squatting. Squatting allows gravity to do a good deal of the work, and seems much less stressful on the momma and the baby. Squatting also takes pressure off the mother's back and opens the mother's pelvis, allowing for more room for the baby. It seems this whole idea of delivery in a bed with the momma in stirrups was set up to make it easier on the doctors, certainly not on the momma and baby. So I can't help but think of those EZ Lube oil change facilities where you drive your car over a hole in the floor and some guy below is able to get to your engine very easily to do all he needs to do. I propose that hospitals and other birth clinics revolutionize their baby delivery facilities by making use of the EZ Lube design. Baby delivery rooms should be on 2 floors (or at least 1.5 floors - perhaps a mezzanine?). The momma can squat over a hole in the floor. Certainly, the shape of the hole would be strategic to fit everyone's needs and it would have the necessary protections to prevent injury, as well as allow for comfort and support of the momma. The doctor could then work from the floor below the momma (perhaps on a step ladder? ), doing all the things they need to do from below. 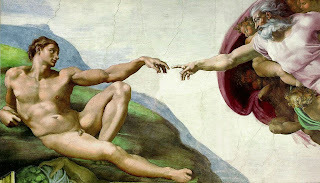 If doctors developed pain in their necks from looking up, I suggest a horizontal platform for the doctors to lay on - not unlike the one Michelangelo used when he painted the Sistine Chapel. The miracle of life could happen so much easier for the momma and baby. How's that for a reversal? - The doctor laying down and the momma squatting over the doc. What do I know? It sounds silly, but it makes sense. I'm also interested in the idea of giving birth in water (like the scene in Apocalypto) - the baby goes from the fluid-filled womb to another fluid-filled environment. I don't know if there are any studies on these ideas, but there should be. "And did you get what you wanted from this life, even so?" "And what did you want?" "To call myself beloved, to feel myself beloved on the earth."